5 Day Budget Costa Rica Budget Package is perfect for sola travelers looking for adventure in Costa Rica. This package vacation is great for those traveling on their own and would like help arranging safe transport, hotels and tours. We take the worry our of planning your vacation. On each tour you will be joined by other people (not necessarily the same people on each tour) and so you will never be on your own on your adventures. Enjoy the beautiful areas of Monteverde and Arenal Volcano on this exciting, affordable, holiday tour package in Costa Rica. On our packages, you have a guide with you on each tour. You will not be with a guide that goes with you from area to area. But on each tour you will have a guide (and the pleasure of meeting new people on each tour!). We have offices in Monteverde, Arenal and Samara if you need any help and we are available by phone and online. Early Morning ....Your vacation starts with a pick-up from San Jose by shuttle transport - forget the worries about public buses and safety. The driver will pick you up from your hotel reception (if it located in San Jose center) and if staying near the airport (in Alajuela) you just have to meet the shuttle at the Holiday Inn Express - which is less than a 5 minute taxi ride from the airport. Enjoy the scenery as you make your ascent to the beautiful green mountains of Monteverde (3 - 4 hours). There will be a stop along the way for a bathroom stop and a snack. The views of the distant Monteverde Cloud Forest are amazing as well as the Gulf of Nicoya. Now with the road improvements to Monteverde the journey is less of a challenge and more of a wonderful photo opportunity! Early Evening .... Night Hike at Wildlife Refuge. A 2- hour, fun and informative hike with a bilingual guide, through a series of trails to observe the nightlife of a growing forest. The trails are well marked and easy to walk in the dusk’s failing light, yet rustic enough to remind you that you’re in a wilderness environment. The walk is generally flat, but there are some not-too-steep uphill and downhill sections. 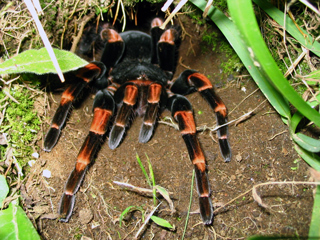 The type of wildlife you might see as day turns to night includes porcupines, toucans and other sleeping birds, owls, agoutis, coati mundis, snakes, walking sticks, tarantulas, katydids, and an array of other cool insects. Once it gets really dark you will hear the creatures that move around at night! Please bear in mind that there are no guaranteed sightings, so don’t expect all these creatures to be waiting just for you! Typically though, this time of transition into night offers a good opportunity to view nocturnal mammals as well as diurnal animals as they prepare for night. 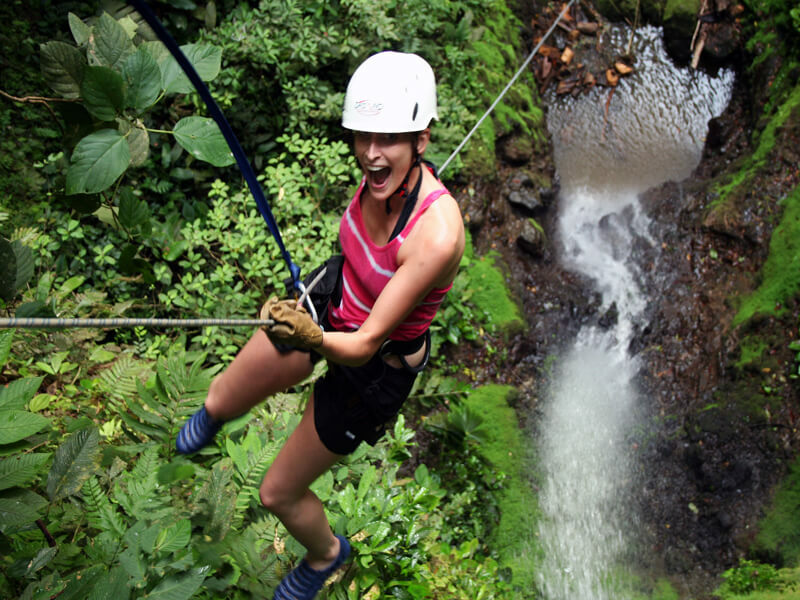 Aventura Canopy Tour in Monteverde Costa Rica now has the longest zipline in Latin America! At 1590 meters long this is thrill that you will remember for a long, long time! The tour includes 11 ziplines, a swinging rope bridge, an exciting rappel and 2 thrilling superman cables (where you literally fly through and over the forest face-forward, just like superman!). Also included in this amazing tour is a MEGA Tarzan Swing: this swings to a height of 45 meters (148ft). Adventura Canopy Tour in Monteverde Costa Rica now has the longest zipline in Latin America! At 1590 meters long this is thrill that you will remember for a long, long time! The price of the Adventura Canopy includes 11 ziplines, a swinging rope bridge, an exciting rappel and 2 thrilling superman cables (where you literally fly through and over the forest face-forward, just like superman! 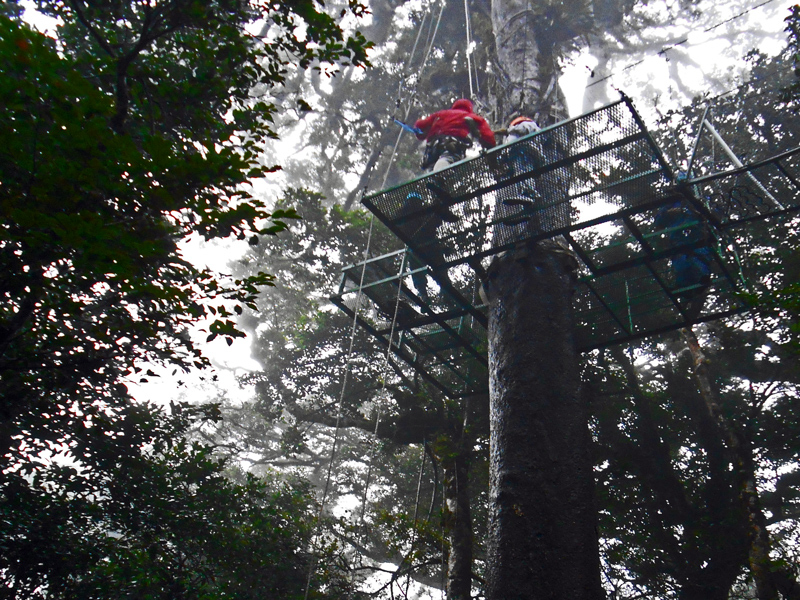 Also included in this amazing tour is a MEGA Tarzan Swing: this swings to a height of 45 meters (148ft). Guided walk in the cloud forest at Selvatura Park. 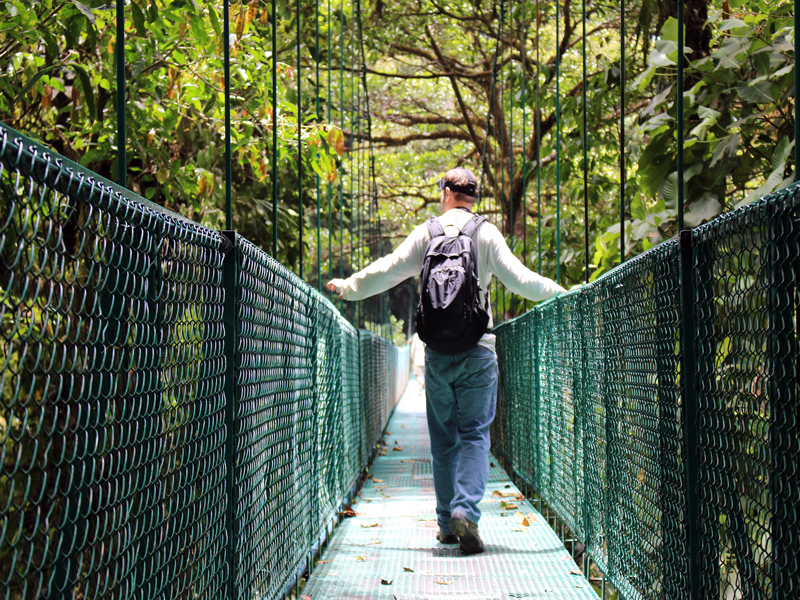 Learn all about the flora and fauna on this guided hike on a series of suspension bridges, hung high in the canopy. The sides of the bridges are fenced off with the railings reaching chest height. The bridges offer a nice perspective with plenty of time to look around and take photos. You can see many trees and ferns from above and the guide will point out any birds that inhabit the upper regions of the trees. Morning. Today you will go to La Fortuna, the nearest village to one of the most active volcanoes in the world, Arenal Volcano. You will travel by what is locally known as "taxi-boat-taxi". - 30 minute boat ride on beautiful Arenal Lake on the foot of the volcano. - 25 minutes microbus transport from Arenal Dam where transport to your hotel in La Fortuna. Early afternoon. . Rainforest Natural History Tour at Arenal Volcano National Park and Baldi Hot Springs. A visit to Costa Rica is not complete without seeing Arenal's famous volcano! Hike through lush rainforest with an experienced naturalist, bilingual guide who will point out flora and fauna in the primary and secondary rainforest that lines the base of the Arenal Volcano. Note though.. that over the last 5 years there has been no lava activity, although sometimes you can still hear it and it is still emitting gases. However, tours are still very interesting as you learn about the history of this impressive volcano! After the night hike we will take you to Baldi Hot Springs where you can soak any aches away from the past few day's activities. 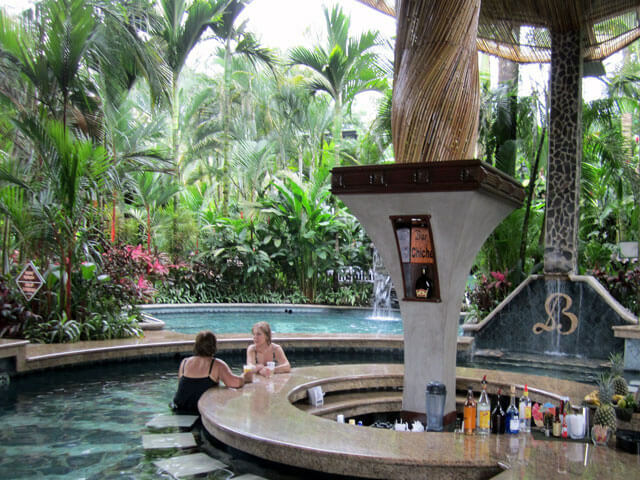 Located near La Fortuna, these Arenal hot springs is a place where you can really relax and pamper yourself. Baldi's has a series of 20 pools and hot springs fed by Arenal Volcano which are set amid glorious tropical gardens so that you can relax in the water, while enjoying the surroundings. The pools vary in temperature, from the temperature of a swimming pool to the warmest at around 39C (102F). It's a place where, on a clear night, you can sit in a warm pool, sipping the cocktail of your choice, while viewing Arenal Volcano. You might also decide to pamper your body by opting for one of the many body treatments which are available such as massage, reflexology, body polish, volcanic mud wraps and facials (these are not included on the tour). NOTE: BALDI HAS QUITE A PARTY ATMOSPHERE SOMETIMES BUT THERE ARE QUIETER POOLS ON THE UPPER LEVELS..... IF YOU WOULD LIKE A QUIETER HOT SPRINGS WE CAN UPGRADE THIS TO ANOTHER HOT SPRINGS (this will have an extra cost). Bring on the adrenaline! 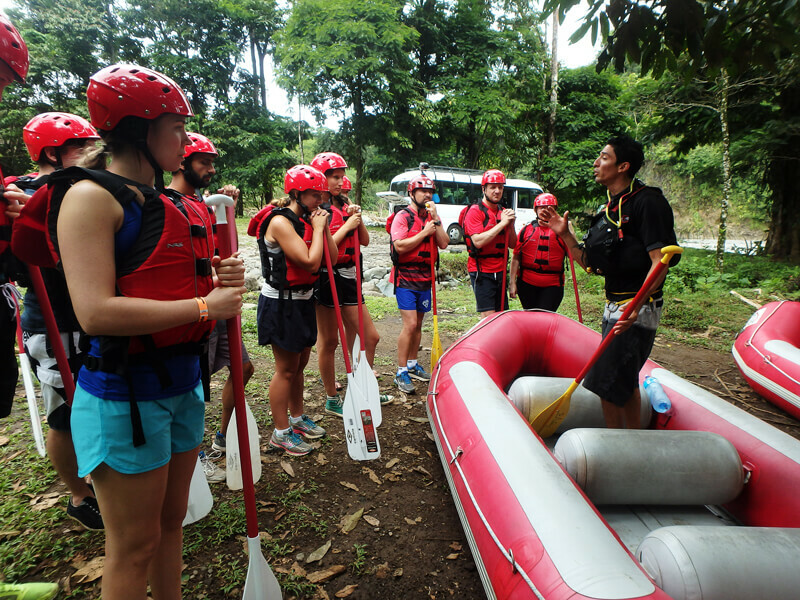 Whitewater rafting Rio Sarapiqui is for exerienced and first-time rafters who love adventure. 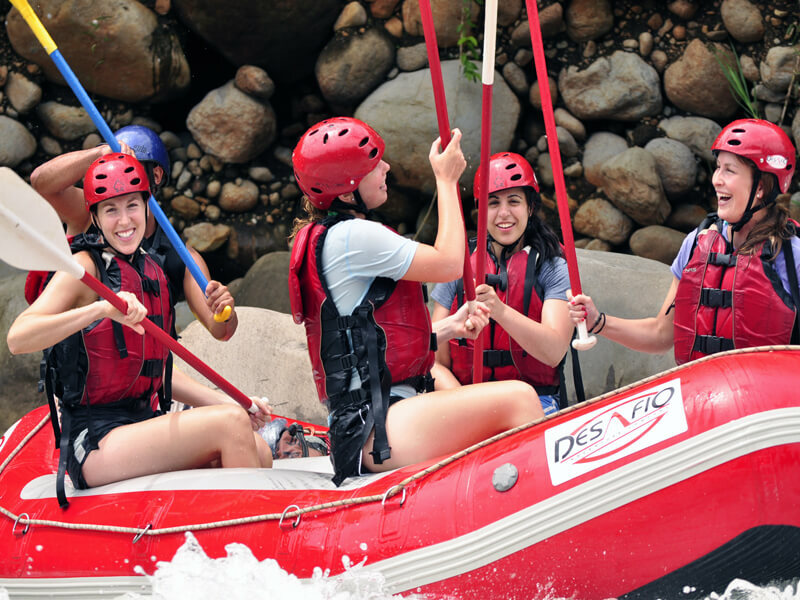 A full-day, class 3-4 rafting on one of Costa Rica’s most-exuberant rivers: a perfect rafting trip for adventurous paddlers. You’ll get about 2 - 2.5 hours of rafting with more than 12 continuous, class-3-4 rapids along more than 10kms of lush, vibrant rainforest. Make your way through exciting rapids like “The Pipeline,” “The Terminator,” and “Dos Locos”. This fast flowing river has its origins from the mountains of central Costa Rica and runs to the border of Nicaragua. The Sarapiquí winds down a narrow waterway, surrounded by lush tropical vegetation, as well as farmland and towering trees. 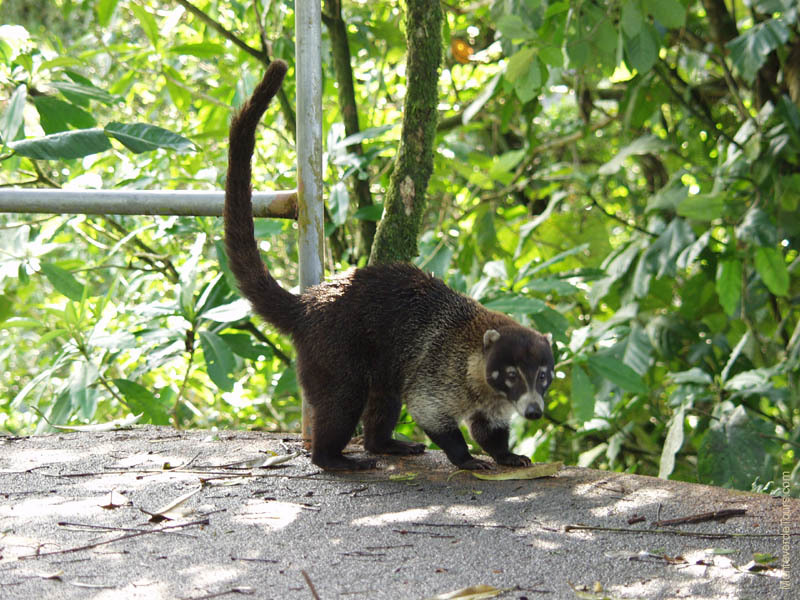 The area is habitat to several different species of birds such as toucans and hummingbirds. 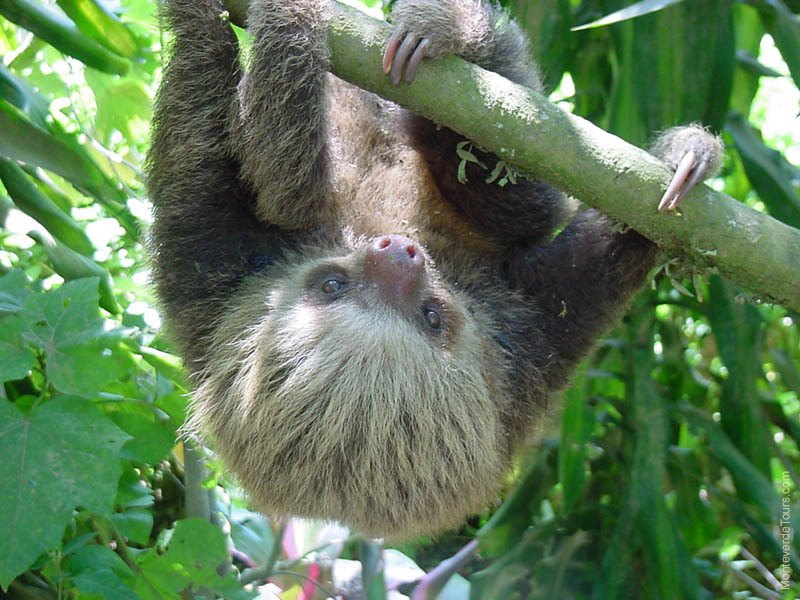 Frequently spotted are monkeys, iguanas, sloths and river turtles . The river is a mixture of exciting white water rapids and quieter sections for wildlife viewing and relaxing! Once at the river, our experienced guides will give you a thorough safety talk, get you set up with your helmet, life jacket and paddle and then you\'re off – we\'ll stop along the way for a nice, tropical fruit break and afterward we take you out for a typical Costa Rican “casado” lunch. You'll return to La Fortuna and the Arenal Area around 3:30-4:00pm. This has an extra cost of $99.. 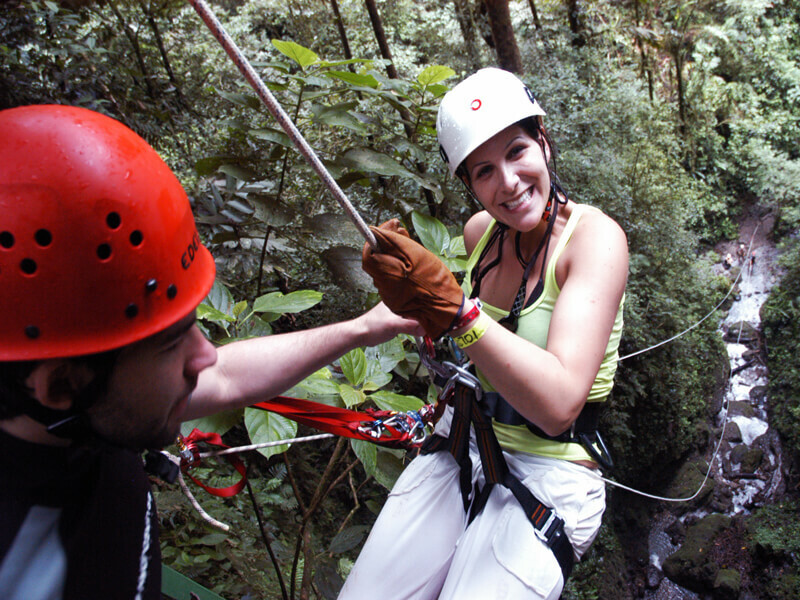 Imagine yourself in surrounded by lush rainforest atop a magical canyon waiting to rappel down some jungle waterfalls! Near the Arenal Volcano, our rugged mountainous terrain is ideal for incredible canyoneering options & huge, breathtaking waterfalls! We combine rappelling, down-climbing and river tracing in a deep, tropical canyon. So what is canyoneering? No experience needed - just a good sense of adventure! 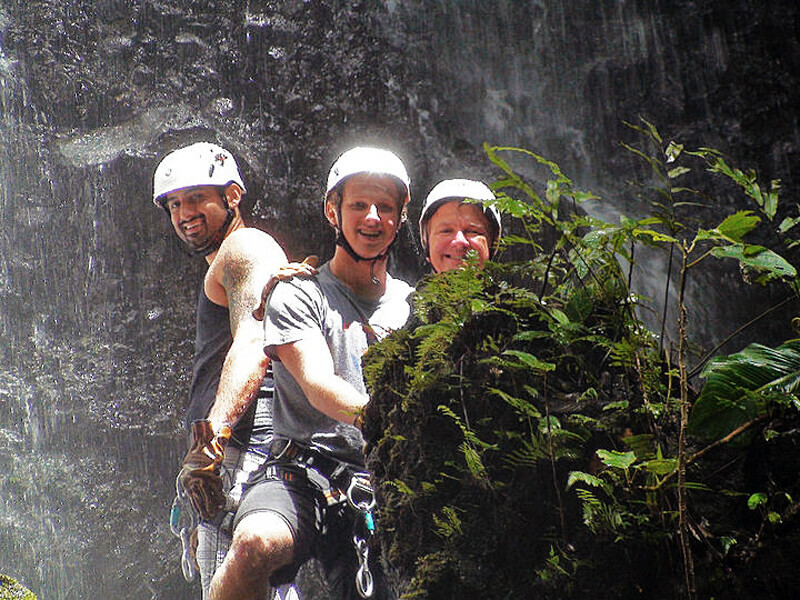 Canyoneering is a mixture of abseiling down waterfalls and hiking in a jungle filled canyon. To start the tour: Travel the old-fashion way! Start off by doing a fun 4x4 off-road adventure as you climb about 15 minutes up into a quiet mountainside community. Prepare to get wet! Your guides will give you a thorough safety talk to explain important rappelling and down-climbing techniques. You will be provided high-quality technical climbing gear such as a harness, helmet & gloves. The hike back up takes about 10 minutes, but take your time to enjoy the lush rainforest that surrounds you. At the top, you’ll arrive at our Canyon House where you can change into your dry clothes and then sit down to a delicious Costa Rican-style lunch. After the tour your shared shuttle transport will pick you up to take you back to San Jose ( if you prefer to go to the main beaches and there is a shuttle available, we can book you on this). We can upgrade to a private transport and you can leave whenever you like please check for costs. In Monteverde we use Hotel Rustic Lodge whenever possible. It is a family run B&B located in Santa Elena, Monteverde, less than a 5 minute walk to the shops, banks and restaurants. The hotel offers very comfortable rooms with private bathroom. Breakfast is included in the package. Located in the center of the town of La Fortuna, Hotel San Bosco provides simple but comfortable rooms with a/c, cable TV and private bathroom. Plus the hotel has a pool, jacuzzi and includes breakfast. Beach Extensions! Ask for details about adding some days at the beach - we can arrange all transport, hotels and tours. Manuel Antonio beach and Samara beach are popular choices. We have many contacts with Manuel Antonio hotels. We can also arrange hotels and transport in San Jose and other parts of Costa Rica. Please let us know if you need our help. * HOTELS CAN BE UPGRADED . THE HOTELS SHOWN IN THE PACKAGES ARE TO GIVE YOU AN IDEA OF PRICE, IN MONTEVERDE WE SUGGEST UPGRADING TO FICUS HOTEL AND IN LA FORTUNA VOLCANO LODGE & SPRINGS BUT WE CAN ALSO USE OTHER HOTELS. PLEASE INQUIRE FOR OTHER COSTS. Dates of trip: We can schedule dates by request. What to Bring: T-shirts, shorts, long pants for riding, sweater or light jacket, sports sandals, light hiking boots, rain jacket, sunscreen insect repellant, any personal medication, swimming wear, towel, traveler's insurance (to include white-water rafting and horse riding, full passport, and credit cards (VISA and MC, other cards may be harder to use). Let your bank know you are traveling to Costa Rica or your card may not work when you get here for security reasons. 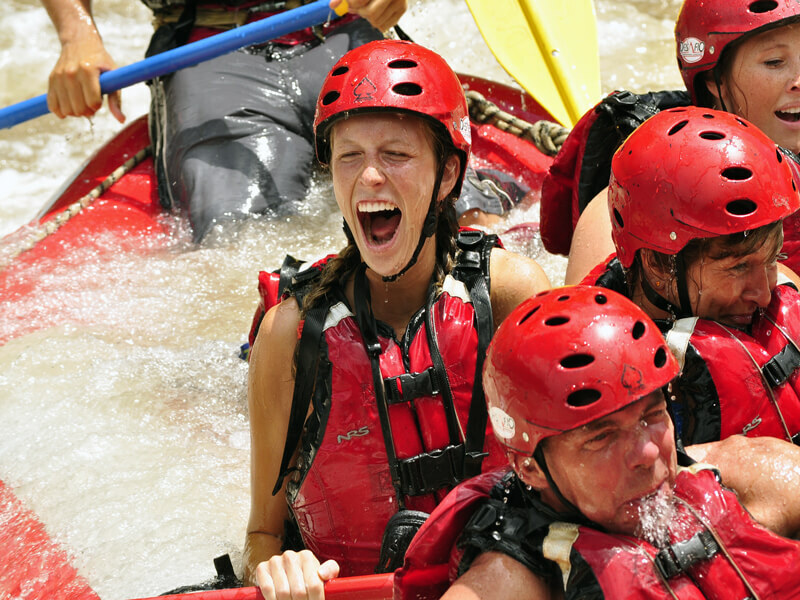 Adventure tours such as whitewater rafting, horse riding, kayaking, canyoneering and hiking require physical effort. Clients should be in good condition. For client safety and enjoyment, Monteverde Tours reserves the right to offer a substitution, postpone, change or cancel any tour due to unfavorable conditions. Full refund is given if (on rare occasion) a tour is cancelled by the operator. Monteverde Tours and its affiliates are not responsible for lost, stolen or damaged items.